Jonathan Aitken was a British politician who became Chief Secretary to the Treasury and ended up in prison. He was the subject of allegations by the Guardian to which he responded with a defamation suit before he was brought to justice. In February 1997, his name was removed from the list of Privy Councilors’, he was only the third member to resign in a century. In May 1997, Aitken lost his Conservative seat. In June, the libel case went to trial and he lost. Scotland Yard began its investigation into Aitken at the same time. In May 1998, he was arrested and charged with perjury and conspiring to pervert the course of justice. Aitken owed money from the settlement to the Guardian. He transferred assets to his wife’s name and they divorced in August 1998. Aitken’s trial began in January 1999, in May he declared bankruptcy. He was sentenced to 18 months in prison in August of that year. 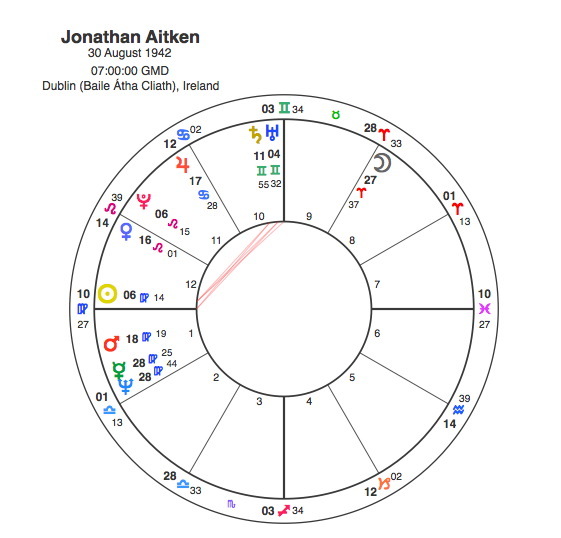 Jonathan Aitken has the Sun and Ascendant in Virgo, but he is not one of the reserved, taking a back seat variety. His Sun and Mars are conjunct the Ascendant, which gives him an assertiveness that is more commonly found in the sign Aries. He also has the Moon in that sign, so this combination would make him hardworking and methodical, a perfectionist but with grand ambitions and a strong determination to succeed, a cool calculating demeanour and the practical means to pursue his goals. It can be quite a ruthless mixture. The standout aspect pattern in the chart is the square from Aitken’s Sun and Ascendant to the conjunction of Saturn, Uranus and the Midheaven ( top of the chart ). The Midheaven rules the career and one’s social and professional standing. Saturn is the principle of limitation and it’s placing here would suggest restrictions and obstacles to career advancement but also a fall from a lofty position. The conjunction of Saturn and Uranus speaks of very powerful ambition being suddenly and unexpectedly thwarted. The whole aspect points to a promising career being suddenly disrupted by a fall from the lofty heights sought by the Virgo / Aries combination. When would this happen ? From 1997 to 1999 Pluto was creating a T Square to all these planets, first of all in opposition to his Midheaven ( career and status ) as he lost his place on the Privy Council and his seat in Parliament and in square to his Sun and Ascendant as he lost his liberty. Pluto ensured that old maxim ‘ the harder they come, the harder they fall ‘. I had the privilege of speaking to Jonathan many Moons again regarding the issue of his Christian faith (found through his experience in prison) and his prison reform work. He is a changed man and shows that even Pluto can bring positive change when working through Gods grace?